Most of the group will now join the rest of their yellow belt team mates and progress through the next level of the syllabus and work towards getting their orange, green & Blue belts . ProKick Kickboxing Mad Kids showed they had what it takes to move up the kickboxing ladder of excellence at the ProKick gym in Belfast. 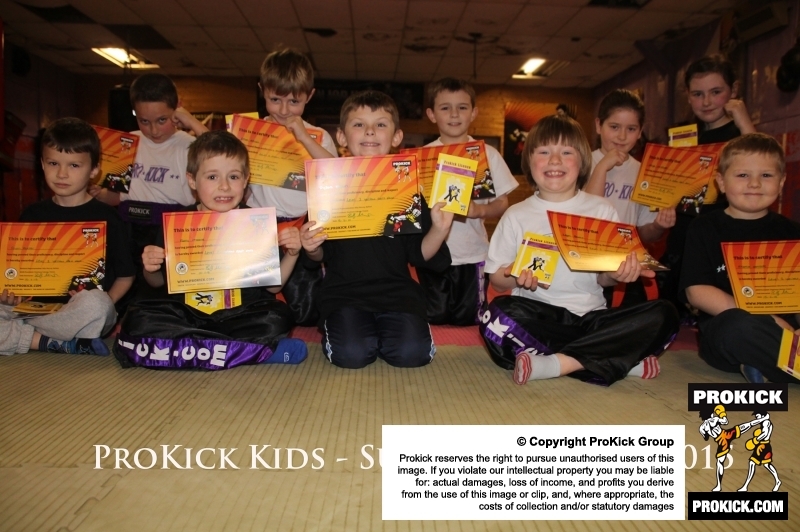 There was a mini grading held today Sunday 15th FEB 2015 at Prokick gym HQ . A select small group of young high kickers went through a series of skills showing they had what it took to make the grade. Well done tonight but don’t forget, there’s still a long way to go boys, the hard work starts now! A grading is when KickBoxing students, non-contact and contact, are assessed through a series of levels/grades, with the base level being White Belt, through ten levels, finally reaching a Dan grade at black belt, which is equivalent, if you like, to a degree level in KickBoxing.This type of achievement would take, on average, between six and eight years. For anyone wishing to know more about kickboxing in your area for kids or adults, please email info@prokick.com or telephone (028) 9065 1074. Wow, that’s great , a big well done to all the young Pro Kickers who graded today, I’m sure your parents are very proud of you. Congratulations everyone. Regards.